The great recession refers to the economic downturn between 2008 and 2013. The recession began after the 2007/08 global credit crunch and led to a prolonged period of low/negative growth and rising unemployment. In particular, the great recession highlighted problems within the Eurozone which experienced a double dip recession and high unemployment. 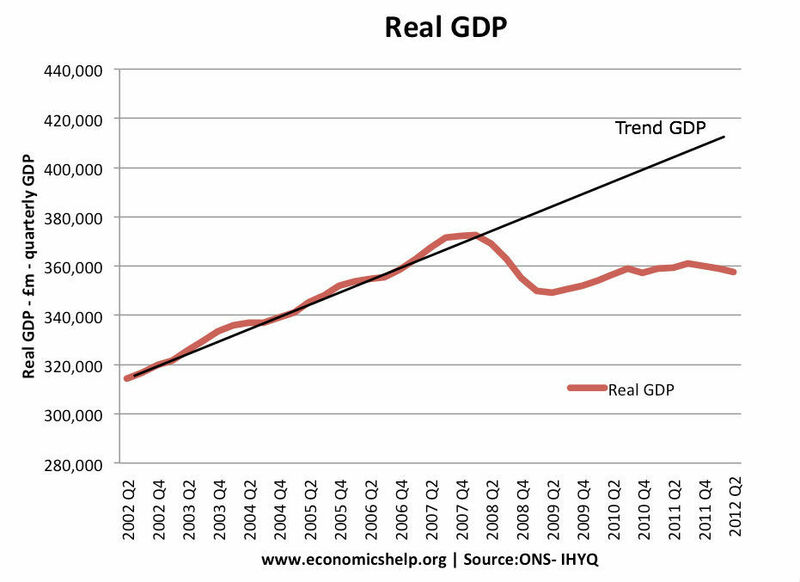 This shows the sharp fall in real GDP in the UK economy in 2008 and 2009. It was also the slowest recovery on record. Graph showing how much real GDP fell behind the trend growth in the UK. Unlike previous recessions, the economy did not catch up the lost output. The primary cause of the great recession was the credit crunch (2007-08). See: Credit crunch for a short background to why bad debts in the US housing market had such a big effect on economies in the US and Europe. Credit crunch led to a fall in bank lending, due to a shortage of liquidity. Fall in consumer and business confidence resulting from the financial instability. Fall in exports from the global recession. Fall in house prices leading to negative wealth effects. Fiscal austerity compounded the initial fall in GDP. In Europe, the single currency created additional problems because of over-valued exchange rates, and high bond yields. Great Moderation. The period 2000-2007 was a time of strong economic growth, low inflation and falling unemployment. Central Banks appeared to be successful in targeting low inflation and ensuring economic stability. However, underneath the macro-economic stability, there was growing instability regarding credit and financial markets. Housing bubble. Many countries experienced a rapid growth in house prices. House price rose faster than inflation and faster than incomes. This boom in housing was encouraged by a growth in bank lending and high confidence. Several countries, such as Ireland and Spain also experienced a boom in house building. 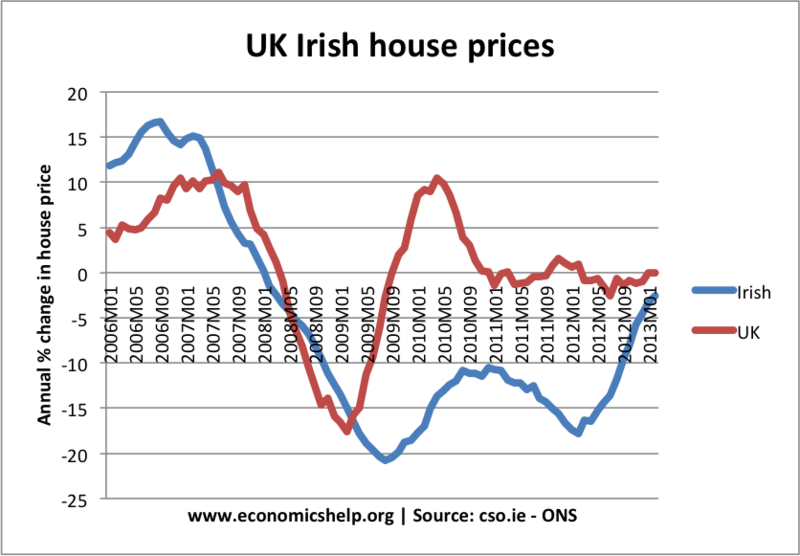 Irish and UK housing price fall in 2008. Bad loans. In the period leading up to the credit crunch, banks became more aggressive and willing to take risks in lending. Especially in America, banks and mortgage companies loosened their criteria for giving mortgages. Many homeowners were given large mortgages, with limited checks on their ability to repay. However, in the economic downturn, people were left with mortgages they couldn’t afford. Bad loans repacked and resold. These ‘bad’ mortgage loans were sold onto other financial institutions around the world. For example, many UK and European banks bought these mortgage bundles from the US (CDOs) and so were exposed to any potential losses in the US housing market. Housing Bubble Burst. In 2006, the US housing market bubble burst. House prices started to fall, and there was a rise in mortgage defaults. Banks began to realise they had lost significant sums of money through the US mortgage defaults. Banks short of liquidity. The scale of bank losses started to increase and it became harder for banks to borrow money on money markets. This caused banks to reduce loans and mortgages. Because banks were losing money, it became challenging to get credit and liquidity. Some banks lost so much they were running out of money. In several countries, such as UK, Ireland and US, major banks had to be bailed out by the government. But, the realisation banks were short of liquidity harmed consumer and investor confidence. The fall in confidence led to lower spending and investment. In 2008, all major economies experienced a very sharp drop in real GDP. The banking crisis severely curtailed normal bank lending. The result was a fall in investment and consumer spending leading to a sharp drop in real GDP. The fall in house prices was another factor leading to recession. In the boom years, rising house prices (and wealth) underpinned higher consumer spending. When house prices dropped, many homeowners faced negative equity. Therefore, they cut back on spending and could no longer rely on re-mortgaging to gain equity withdrawal. The global nature of the crisis meant that there was also a drop in world trade. Countries saw a drop in exports as the global downturn led to lower demand. In 2008, there was also a peak in oil prices. This complicated matters because it caused cost-push inflation. This cost-push inflation made Central Banks more reluctant to cut interest rates. Also, higher oil prices reduced discretionary income and led to lower spending. Usually, in a recession, oil prices fall. However, because of rising demand in China and India, we saw rising oil prices – even as Europe and the US went into recession. High oil and commodity prices was another factor reducing demand. Bank rescues. Firstly, governments felt obliged to intervene in the banking sector to avoid banks and financial institutions going bust. However, there was some reluctance to bailout those who were blamed for causing the crisis. In 2008, the US decided to allow Lehman Brothers to go bust. This caused a major loss of confidence. After the panic this created, governments realised they couldn’t allow a repeat of this experience. In the UK, the government intervened to bailout out major banks, such as Northern Rock, and Lloyds TSB. Cuts in interest rates. Towards the latter half of 2008 and early 2009, Central Banks cut interest rates to record low levels. 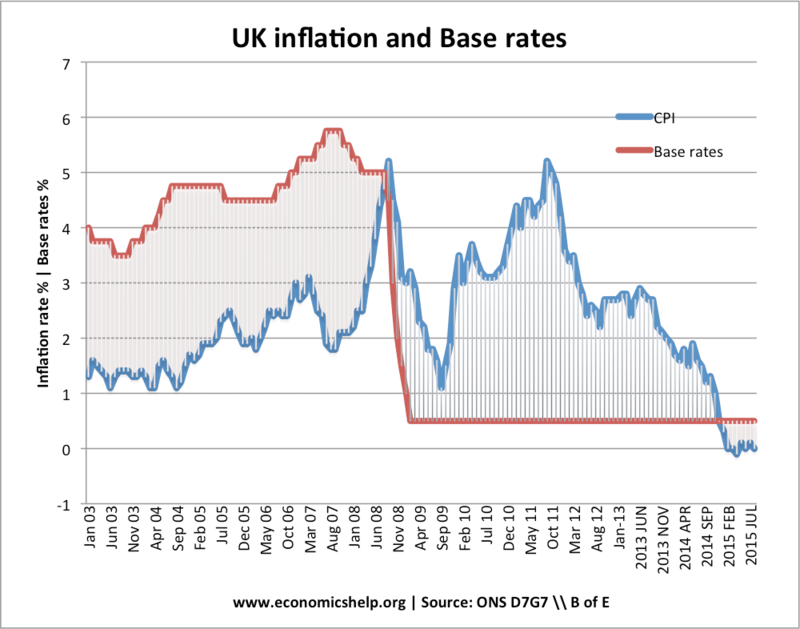 The UK cut base rates from 5% to 0.5%. Usually, a major cut in interest rates would make borrowing cheaper and encourage consumption and investment. (e.g. in 1992, when the UK cut interest rates, the economy recovered fairly quickly.) However, cuts in interest rates were less effective in this period. Expansionary fiscal policy. The deep recession saw a sharp rise in budget deficits because government tax revenues evaporated. This was particularly noticeable for countries who relied on stamp duty and tax from the finance sector. However, in the UK and US, there was a moderate degree of fiscal expansion. The UK introduced a temporary cut in VAT. In the US, there was also a moderate fiscal stimulus. It is worth noting that in comparison to the great depression of the 1930s, two things were avoided in the great recession. There was no major trade war. In the 1930s, a tariff war developed as countries tried to protect domestic industries. 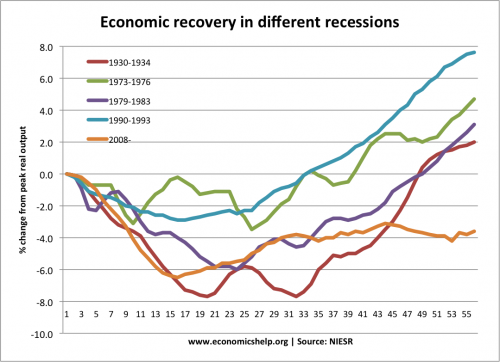 Why did normal policy fail to achieve a proper economic recovery? Balance sheet recession. Firstly, the recession was very deep. Because firms, banks and consumers were highly indebted, they decided they needed to pay down debt. Therefore, this led to a significant fall in spending as they concentrated on paying off debt. In the UK, the saving rate rose from 0% to 7% in a short space of time. This can be referred to as a balance sheet recession. Credit remained tight. Although credit was, in theory, cheap, it was difficult to get any loan. Banks were short of cash so discouraged lending. It became very difficult to get a mortgage, so demand for housing remained low. Productivity crisis. The UK economy experienced unexpectedly low productivity growth (2007-2017). This was due to various reasons – low wage growth, flexible labour markets, limited technological innovation and investment. It suggests there is a fall in the underlying trend rate of economic growth. Graph showing the long-term decline in average growth rates in Eurozone. 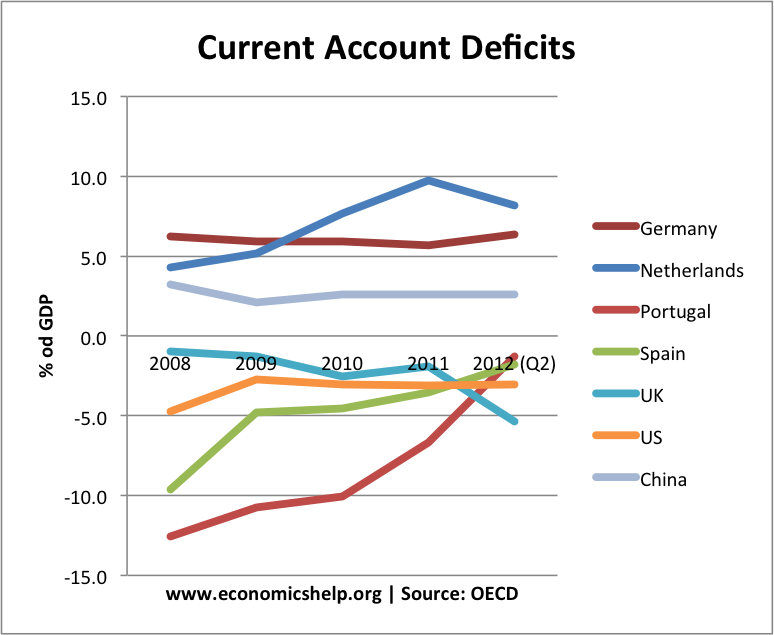 Countries in the south, such as Portugal, Spain and Greece ran a very large current account deficit. This meant the south was uncompetitive, leading to lower exports. After the crisis, these countries needed to restore competitiveness through internal devaluation – essentially lower wages. This caused lower demand and lower growth. No Central Bank. In the UK and US, bond yields fell during the crisis. With their own currency, they have a Central Bank willing to intervene and buy bonds if necessary, this avoids any liquidity shortages. 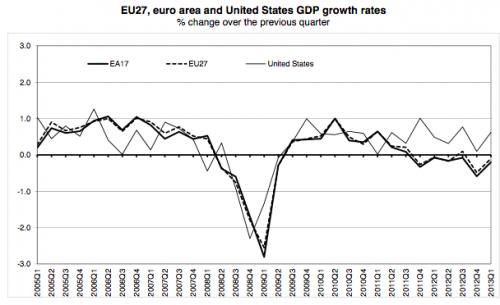 But, in the Eurozone, this didn’t occur (at least not until late 2012). Therefore, bond yields rose, and countries felt a need to cut budget deficits quickly. The UK and US only pursued very moderate austerity in 2011/12. But, some countries in Europe, cut government spending very significantly. 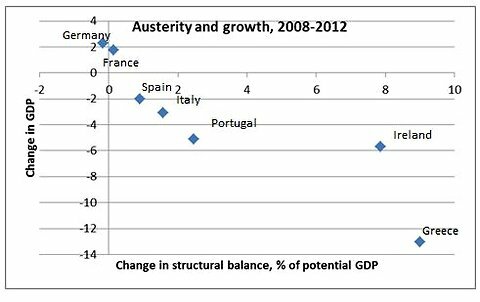 Showing relationship between austerity and growth. Source: Krugman, P.
Fiscal austerity. Combined with falling private sector spending, government spending cuts caused aggregate demand to fall sharply. Weak monetary policy. 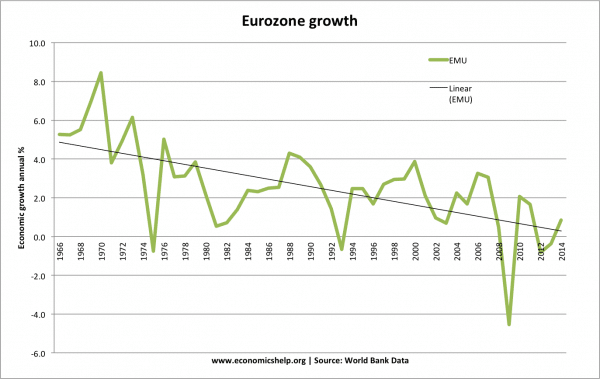 The ECB is responsible for the whole Eurozone and is unable to target higher growth in depressed areas. The UK and US adopted quantitative easing, but the ECB is much more reluctant. Housing markets vulnerable. Countries like Spain and Ireland saw a boom in house building, which created a large surplus of housing. This has meant the fall in house prices was more sustained than say the UK. Unemployment. In southern European, countries like Spain, Greece and Portugal have experienced depression-level unemployment and falls in GDP. In Spain, Greece and Portugal, unemployment is close or above 20%. Youth unemployment is even higher. 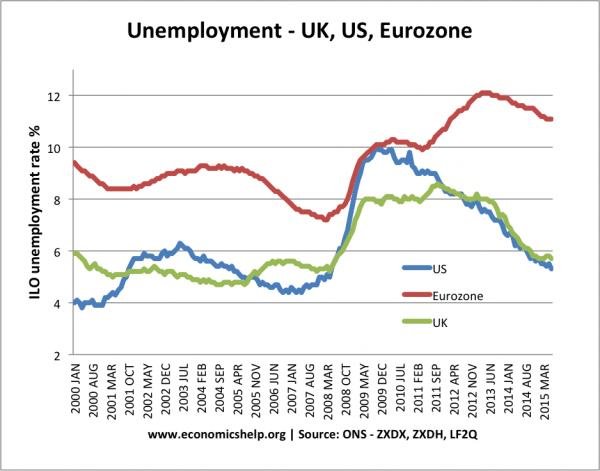 The rate of unemployment fell quicker in the US and UK than the Eurozone. The higher unemployment in Eurozone was due to greater fiscal austerity and lower economic growth. It has also been attributed to less flexible labour markets. The initial recession hit the UK hard because of our relative reliance on the finance sector. The drop in GDP was longer lasting than in the 1930s. Despite, cuts in interest rates and large sums of quantitative easing, the UK economy stalled in 2011 and went into a double-dip recession. Some felt that the government’s austerity drive of 2010-12 was a significant factor in causing this double-dip recession. Although spending cuts were relatively mild, there was also an adverse impact on confidence. However, unemployment rose less than might have been expected (UK unemployment mystery) Most economists feel that the UK experience would have been worse, had we been a member of the Euro. Bond yields would have been higher. No Central Bank to act as lender of last resort. There may have been pressure for much deeper austerity. We couldn’t have benefited from 20% devaluation in Pound. Interest rates would have fallen more slowly. Less scope for quantitative easing and funding for lending scheme. 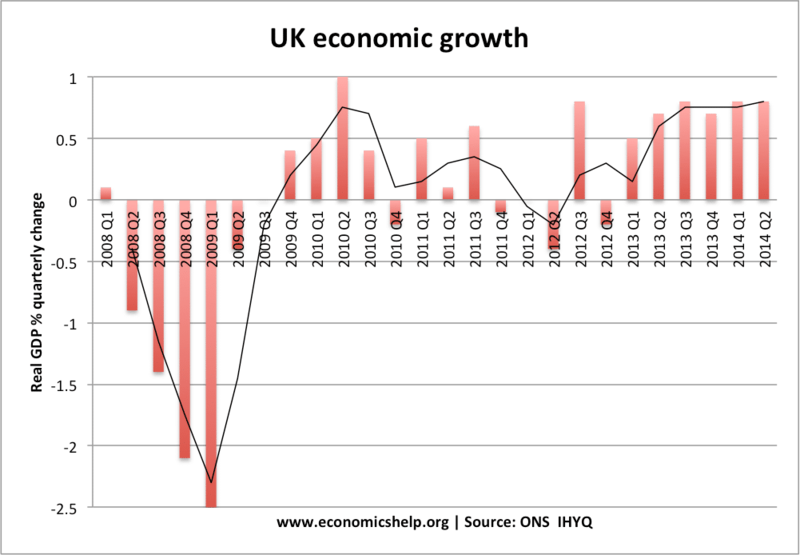 However, the UK economy is still reliant on exports to Europe and a continued EU recession is a factor in slowing UK growth. This entry was posted in economics and tagged recession. Bookmark the permalink. As always a very clear and useful article. Do we know what the position of UK banks actually is? Also how important is the loan deposit ration (Greg Pytel makes much of this). Is it correct that banks are still lending more than 100 percent of deposits? Is it not a simple mathematical fact that this cannot be sustained? Not really. It’s hard to find data on things like that. ….and the loan – deposit ratio?